Came to Aceh, Indonesia for research fieldwork! I arrived at Banda Aceh, one of the greatest hit cities during the 2004 Indian Ocean Tsunami that resulted in more than 200,000 deaths in over 14 countries. A friend I met on board the Peace Boat cruise I joined last year introduced to me some locals. They cordially welcomed me at the airport before bringing me around the city, visiting the Aceh Tsunami museum, meeting and interviewing some representatives of a local organization that uses art to raise awareness about several social issues, and also getting some survey done for my research. Looking forward to the next few days here! I went with my research gang on motorbikes to the outskirts of Aceh. The scenery from the top of the mountain was absolutely breathtaking. We did some survey with the people living in the relocated settlements on the mountains. The people in Aceh are unbelievably friendly. When we approached them for survey, not only did they not show a hint of apprehension, they warmly invited us into their homes as we chatted while doing the survey. Today has been another great day. Reached the target of number of respondents for my questionnaire survey, all thanks to my hardworking research team! Looking forward to tomorrow’s interview and focus group discussion. We went to a coffee shop along the river today and spoke to some fishermen. The way they perceive development, DRR and the government was extremely intriguing, and was vastly different from people living in the city. After chatting and surveying the local people over the first 3 days, I had interviews with representatives from the Aceh Disaster Management Agency, head of a local NGO, university professor and a geucik (village leader). It’s important to learn from various perspectives! Going back to Singapore tomorrow! From the fishermen and housewives sitting around at the coffeeshops to university and high school students, NGO leaders to officials of government agencies, from geucik (village leaders) to imeum (religious leaders), it has been a fantastic experience meeting and talking to people from all walks of life in Aceh. 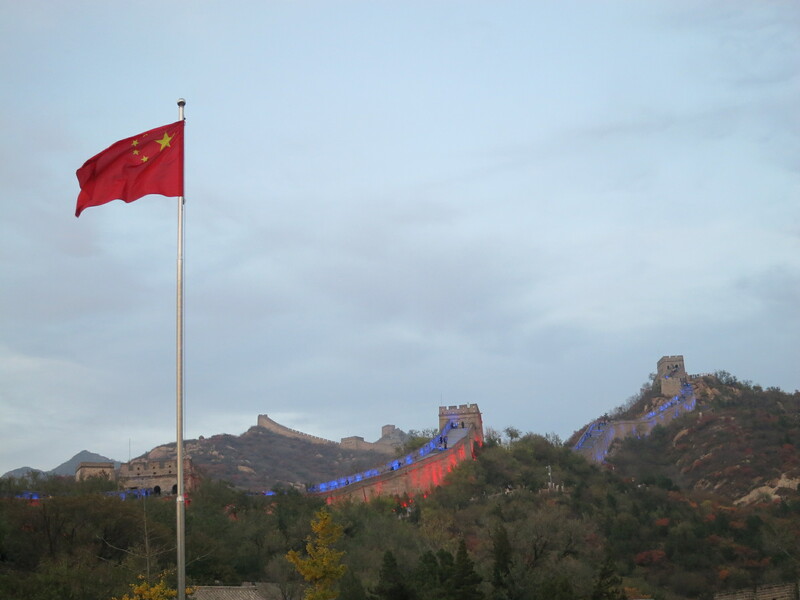 I have had limited knowledge about the history and culture of this amazing place prior to this, but this trip has been full of surprises. Aceh has had a unique history rife with conflicts due to the 30-year long GAM independence movement, and everything changed after the 2004 Indian Ocean Tsunami. Much more than the “research data” I was looking for, this place has taught me important history lessons, the value of peace, the allure of diversity and the sheer beauty of altruistic hospitality. I really appreciate all the warm and generous help, as well as cordial friendship, in Aceh. 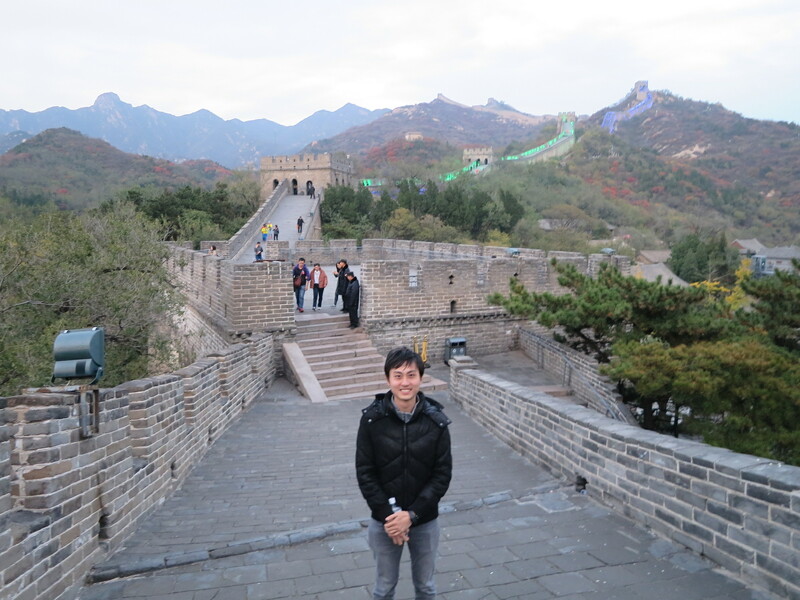 Hope to go back again! Went to Bohol Island of the Philippines for research fieldwork! Bohol Island suffered tremendous damage from the Magnitude 6.9 earthquake in 2013, which was followed by the Super Typhoon Haiyan (Yolanda). I visited Tungod, a barangay (village) part of the Inabanga town, which was one of the greatest hit regions in Bohol. The disaster in 2013 left the entire village without running water supply since then. More than 90% of the men in the village are fishermen and most people are living near poverty levels. 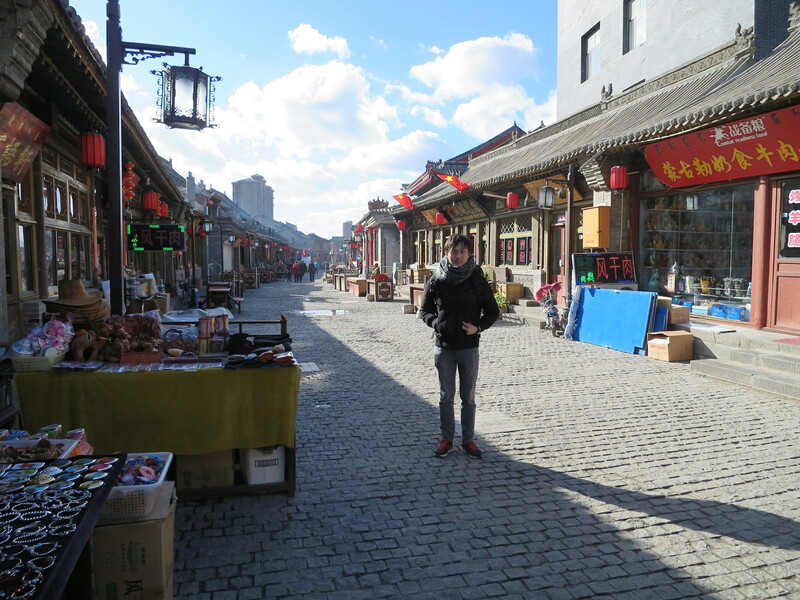 However, the people were extremely friendly with wide smiles and welcomed me with warm open arms. 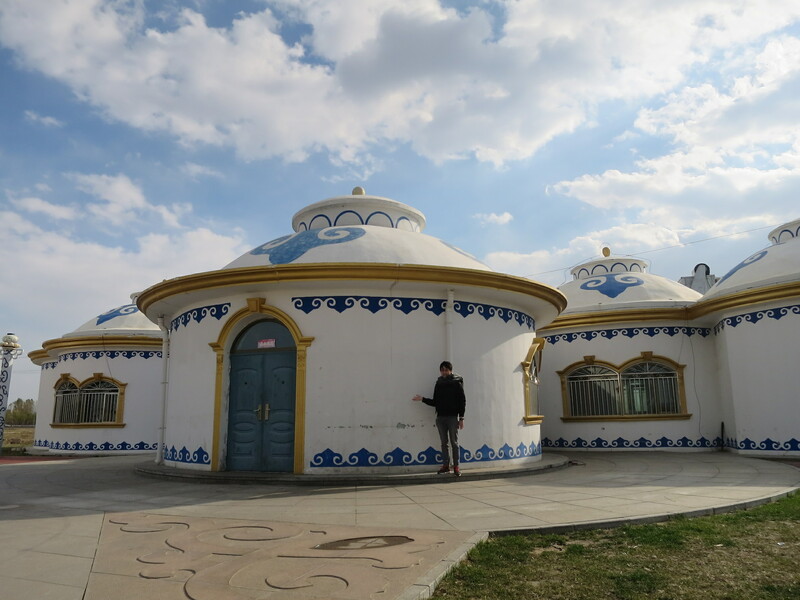 Thanks to my friend who knows the village chief, I had the luxury of staying at the chief’s house, which had no running water supply too, so I bathed by scooping water from a huge tank. The chief and her family members helped me a great deal by translating my survey into the local Visayan language, and helped me gather the villagers for the survey. I depended entirely on the villager’s niece to interpret for me during the research at first, but on the second day, I made friends with a few villagers who spoke decent English and went around to talk to the villagers by myself. What surprised me the most was that many of the children spoke Japanese!! This village has been welcoming interns from Japan to help with the development of the village for some years now. And that was where the children picked up random Japanese phrases. 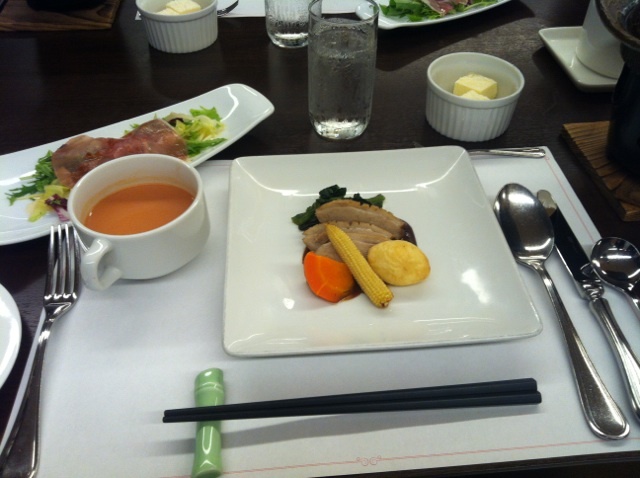 When they knew I was a Singaporean from Japan, they started spouting random Japanese phrases. Whenever a motorbike was approaching, the children would shout together “abunai abunai abunai!” meaning “be careful/ dangerous!” in Japanese. After the memorable stay at Tungod, I came to Manila yesterday and had one of the best seafood meals I’d ever have! I’d be touring around Manila today before returning to Tokyo tomorrow. 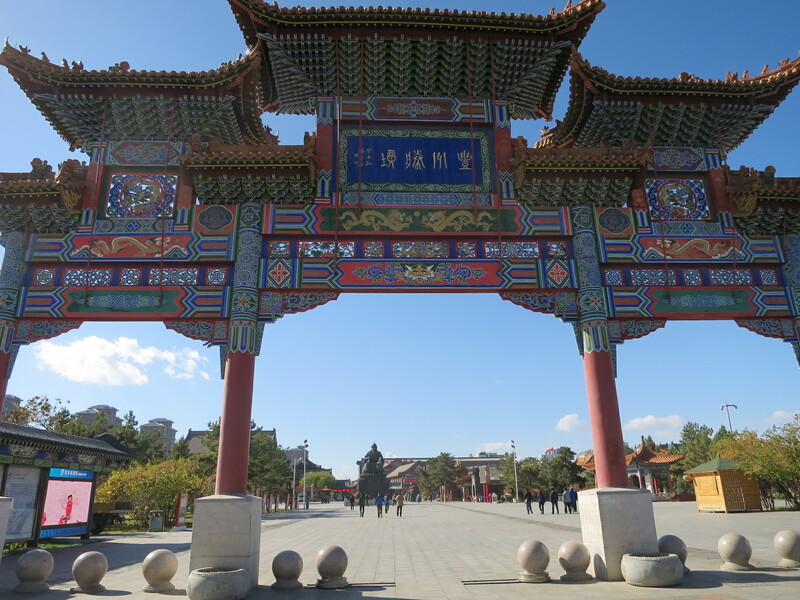 Back from Beijing and Hohhot (Inner Mongolia)! 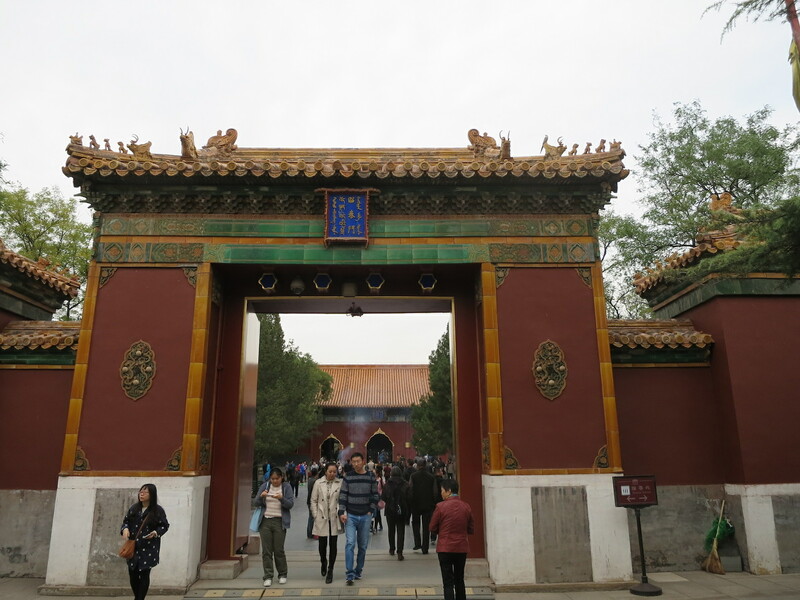 I participated in a joint symposium between Tsinghua University and the University of Tokyo, and came to Beijing for the first time in 16 years! 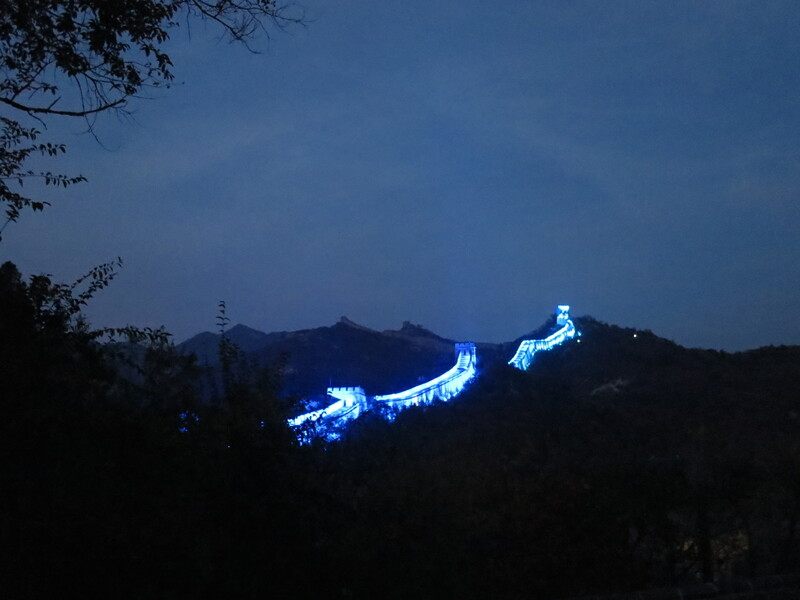 After our symposium, we had a campus tour around the beautiful and green Tsinghua University, went up the Great Wall of China that was awfully lit with strangely coloured illuminations and visited the Confucian Temple. 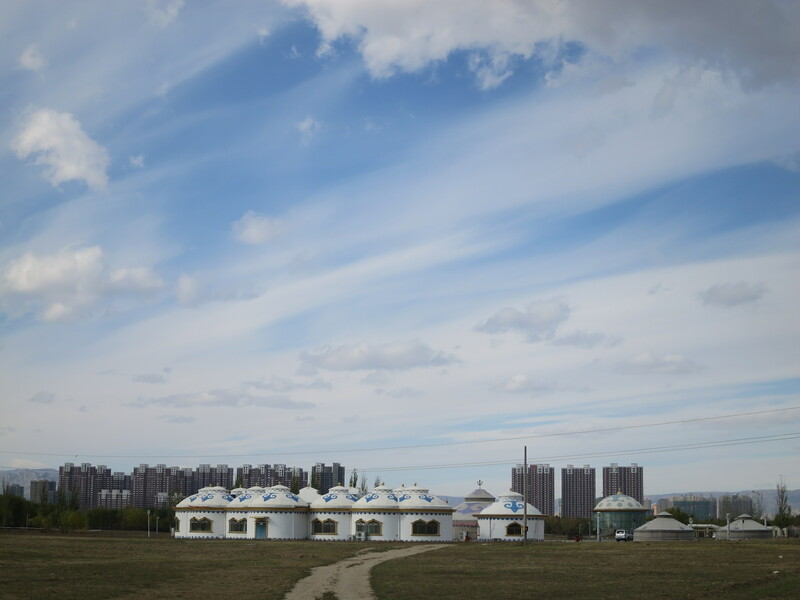 After a four-day stay in Beijing, I embarked on a short journey to Inner Mongolia. 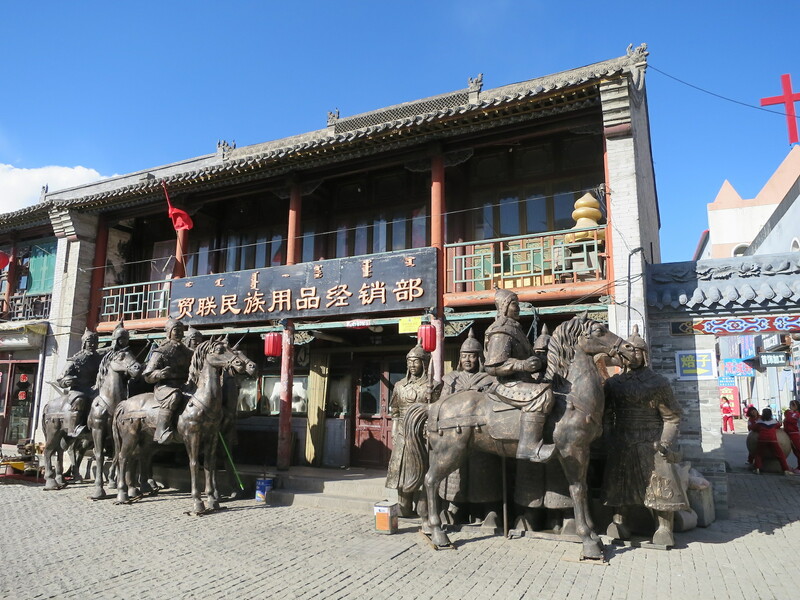 Hohhot is the capital city of Inner Mongolia, and is situated northwest of Beijing. 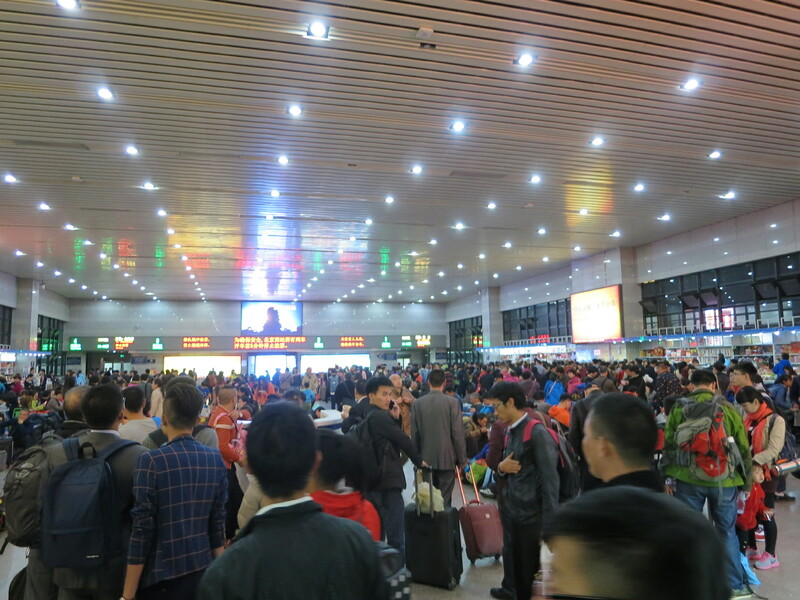 I rode in a 4-man sleeper cabin on the night train for 9 hours before arriving in Hohhot. The temperatures range from -3 to 8 degrees Celsius. 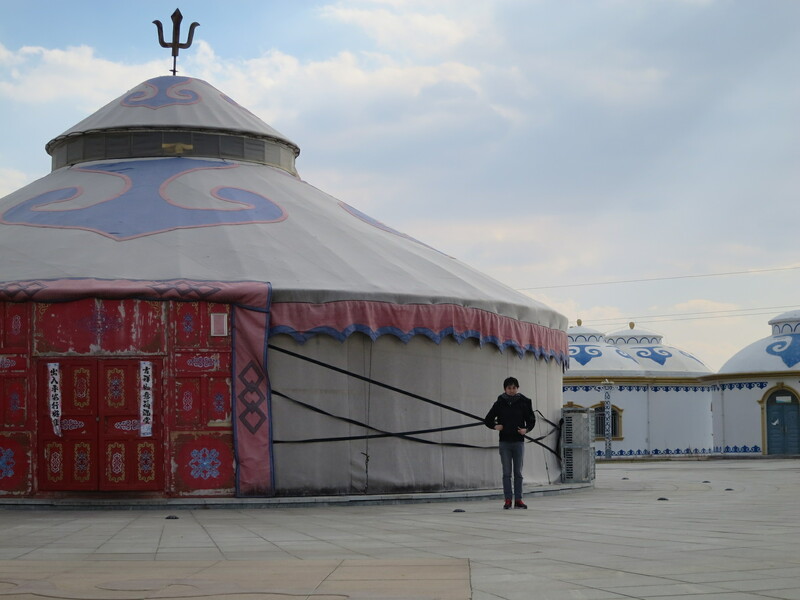 Inner Mongolia is famous for its vast grasslands, beautiful deserts and spectacular mountain ranges, but unfortunately, I came slightly too late. The temperatures have plunged below zero in the grasslands and I was dissuaded from going by the hotel staff. 呼和浩特でイスラム教のモスクがあるとは！びっくりして思わずタクシーの運転手にあれなに？聞いた。Never unexpected to see islamic mosques in Hohhot! I was so surprised I asked the taxi driver spontaneously what that building was. 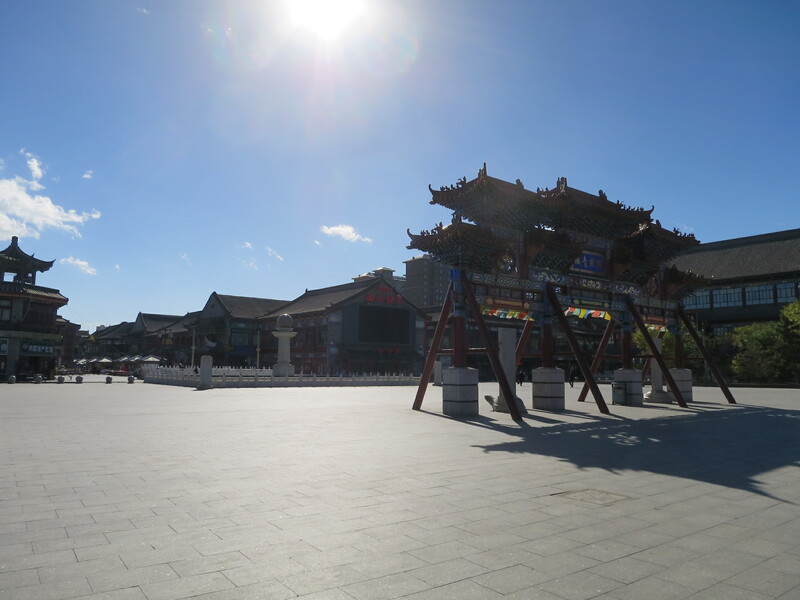 呼和浩特にある最古の建築物である大召寺とその周りの綺麗な町並み。Dazhao Temple, the oldest building in the city, and its beautiful surroundings. 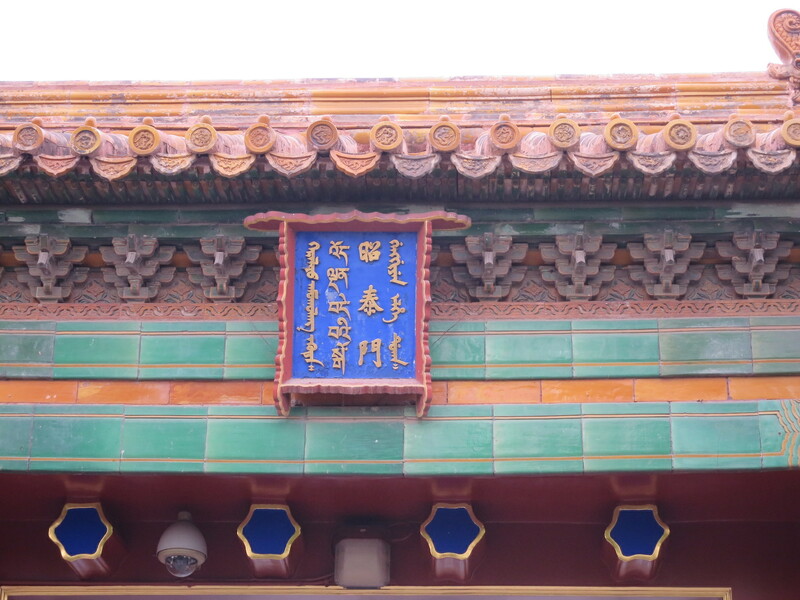 知る人ぞ知る、このお寺はチベット仏教から影響を受けている。This temple is heavily influenced by Tibetan Buddhism. You might be able to tell from its architecture and design. 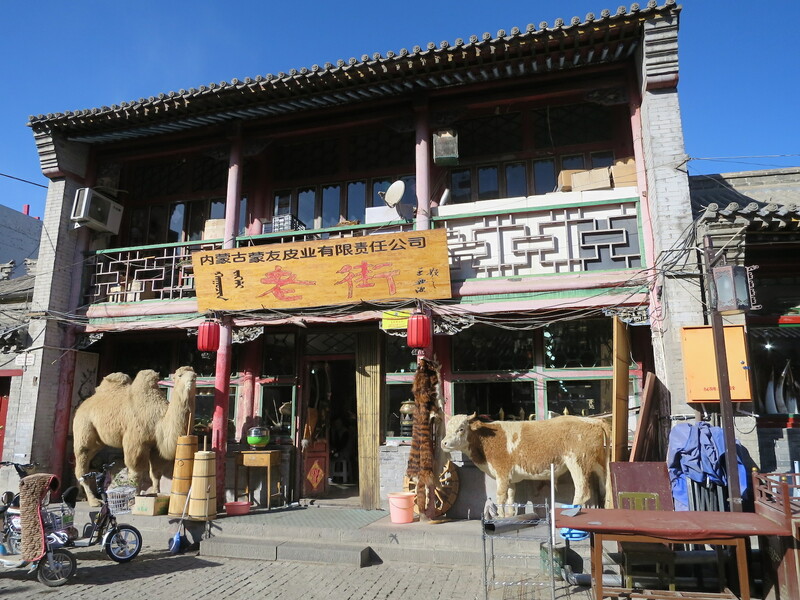 Hohhot city itself is pretty interesting though. 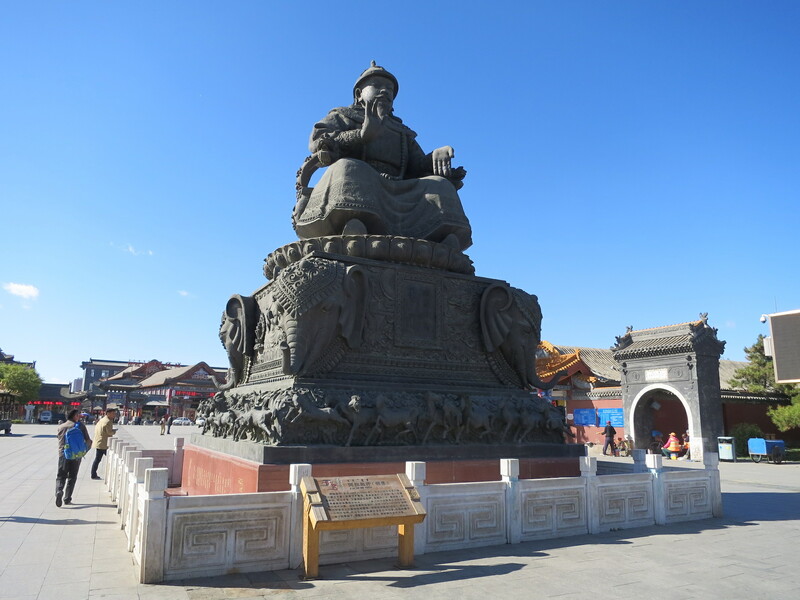 Hohhot, or Inner Mongolia itself, has a history of being invaded by diferent “countries”, and thus it is influenced by a variety of religions, including Mahayana Buddhism, Tibetan Buddhism, Islam and Christianity. 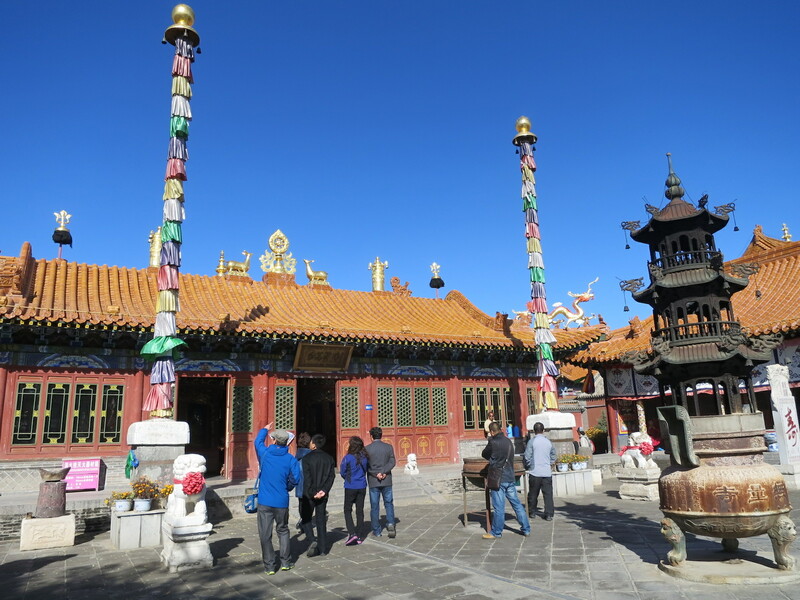 Dazhao Temple is the oldest building in the city, which is a temple heavily influenced by Tibetan Buddhism, and was made famous by a visit by the 3rd Dalai Lama. 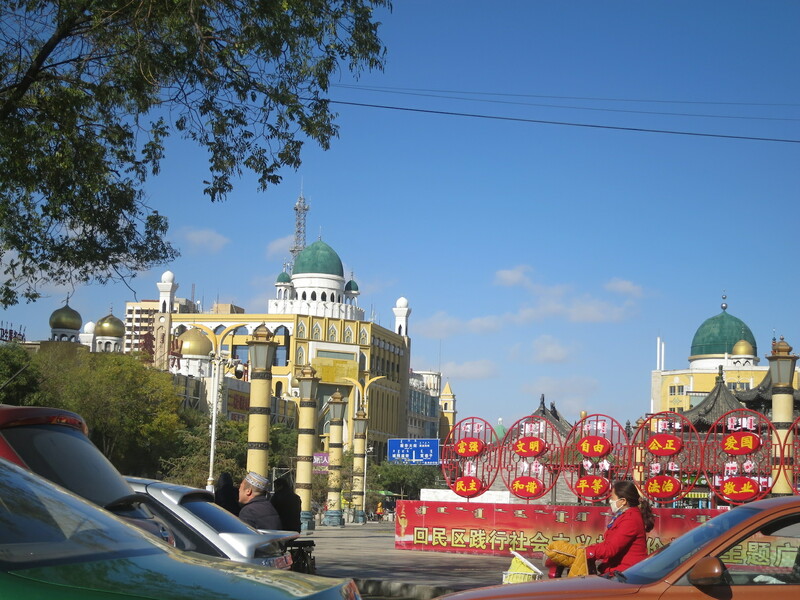 You can also see Islam-influenced buildings and even mosques on the streets of Hohhot. 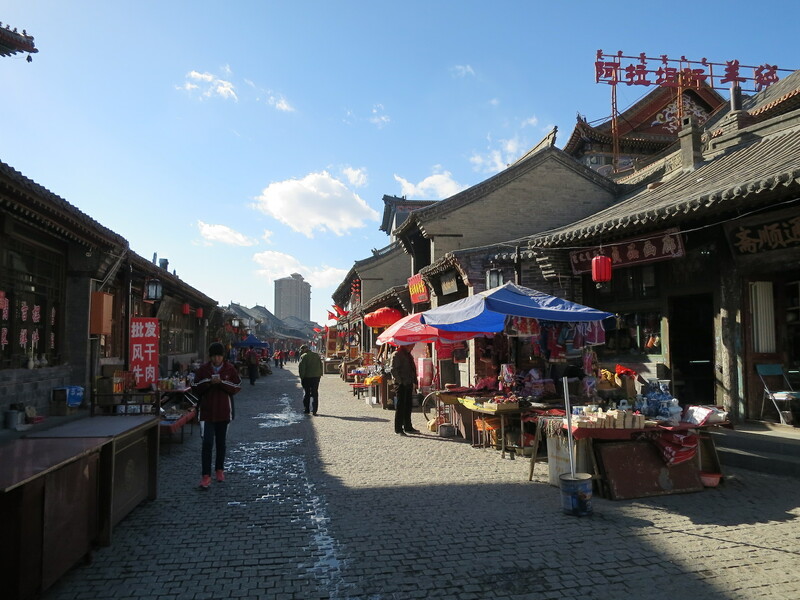 There is also an old street with traditional styled shop houses. 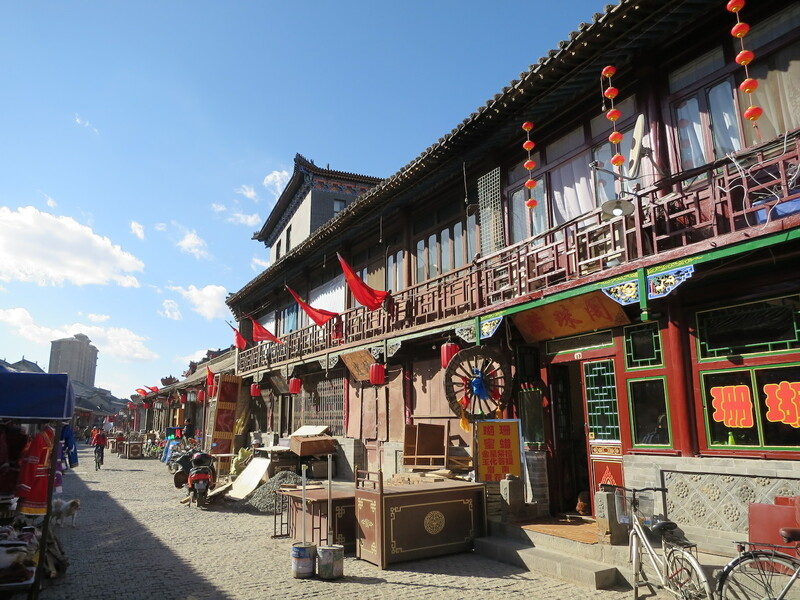 呼和浩特の古い町並み。The old streets of Hohhot. 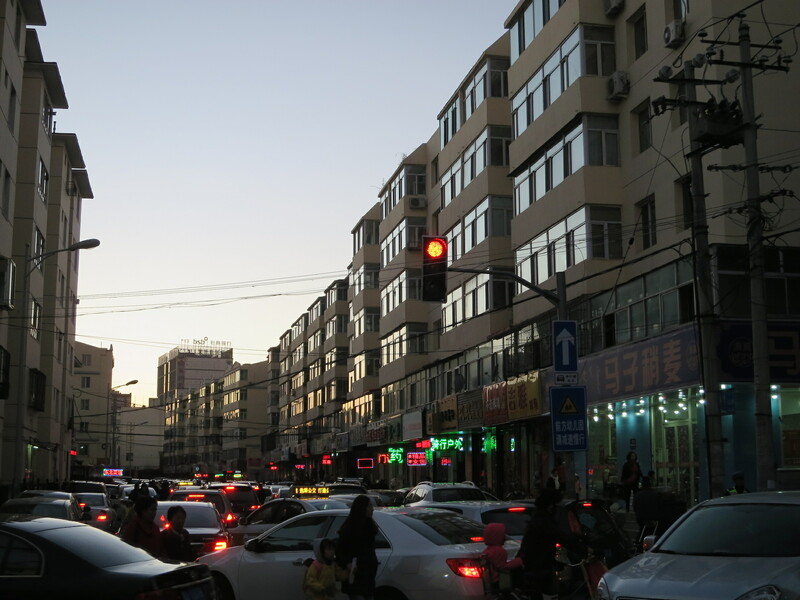 Hohhot was surprisingly extremely urbanized, with tall buildings and cars everywhere. 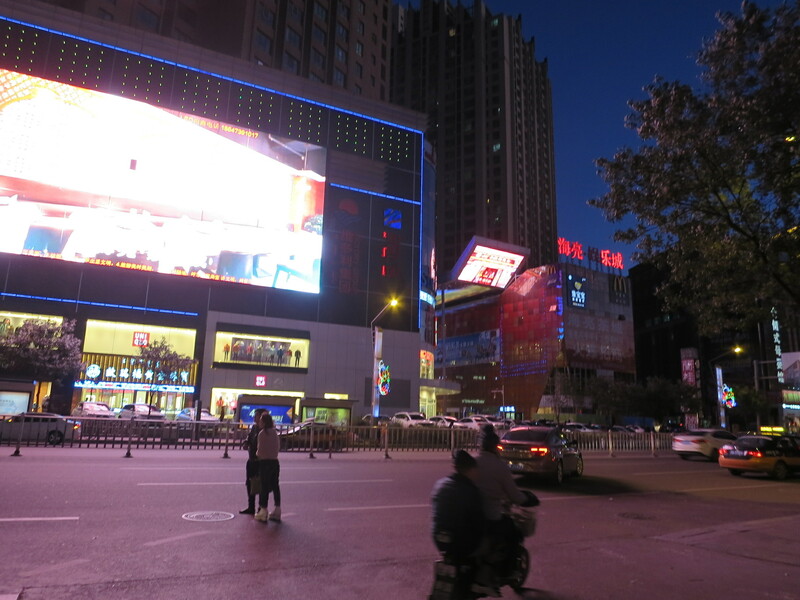 When I walked down the main shopping district at night, I was surrounded by foreign branded apparel shops such as H&M and UNIQLO, and was blinded by the bright neon lights and advertisement screens. It felt no different from Orchard Road in Singapore or Shibuya in Tokyo. Capitalism is really quite scary! 呼和浩特の繁華街である中山西路。ユニクロ、H&Mなど海外ブランドの店も進出している！Zhongshan Xilu Street, the bustling shopping street of Hohhot, lined with foreign brand apparel shops such as Uniqlo and H&M! When I rode on the shared taxi with two other passengers, the driver asked me where I was from, probably because of my starkly distinct accent. 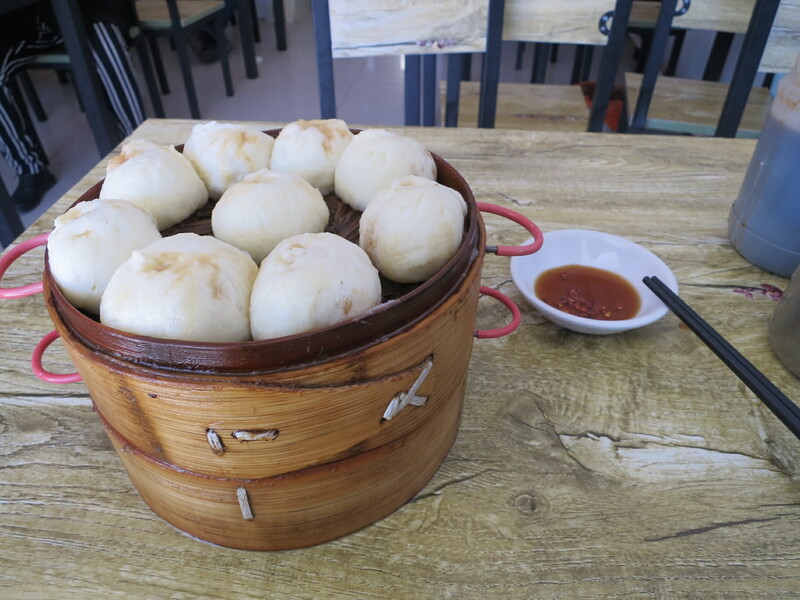 When I answered “Singapore”, they were all surprised and we started talking about Singapore. The accent here is really heavy and to be honest I can only catch half of the conversation most of the time. 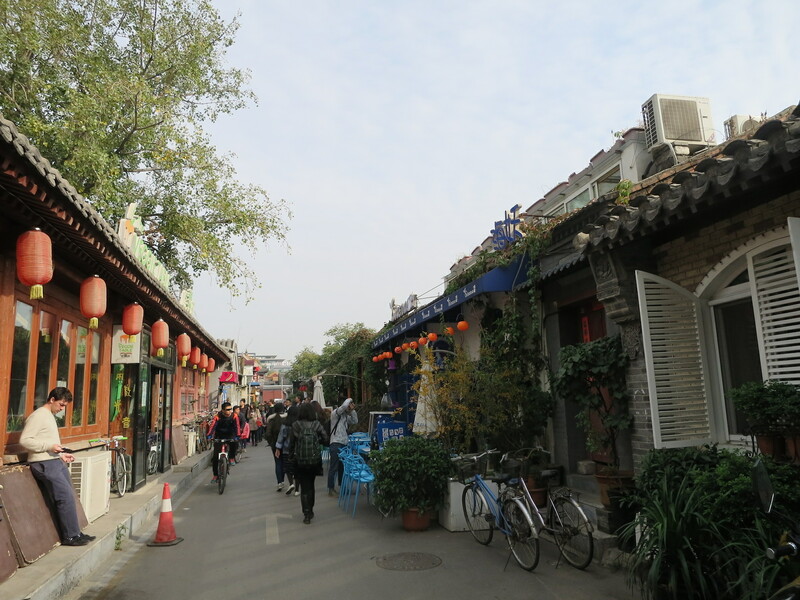 Of course, there are people like the hotel staff who speak with the more “neutral” Mandarin accent, and people like the taxi drivers and shopkeepers who mercilessly lash out a virtually different tongue. 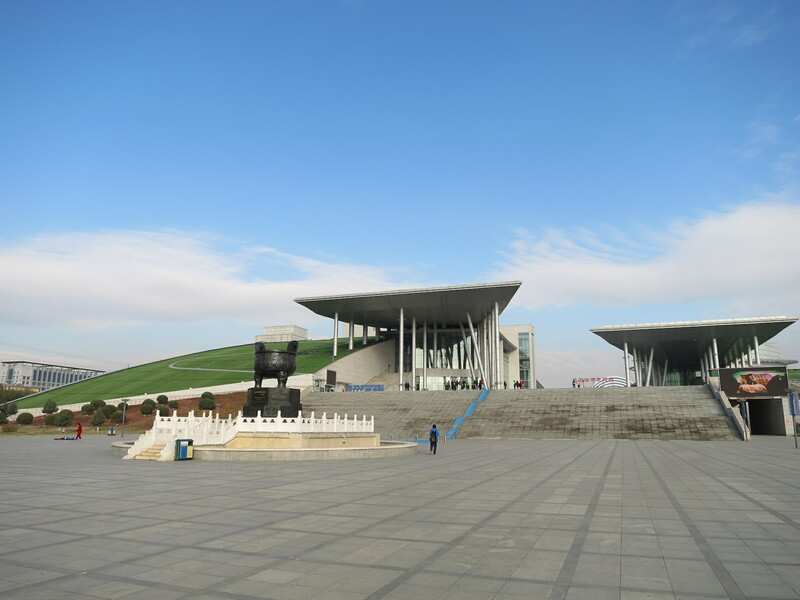 The Inner Mongolia Museum was especially interesting and educational. 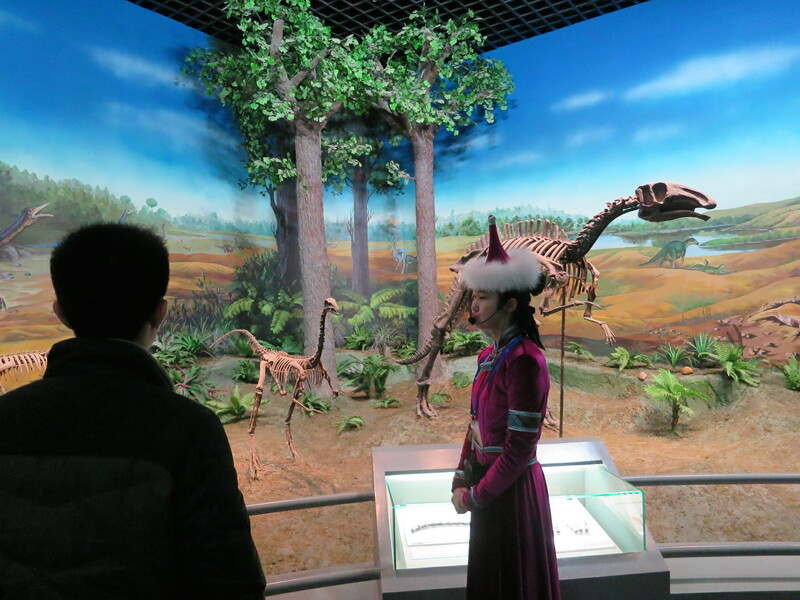 From the existence of dinosaurs in this area several millions of years ago, to its history of nomads and a myriad of ethnic groups living in this region, Inner Mongolia truly has a long and rich history and culture. 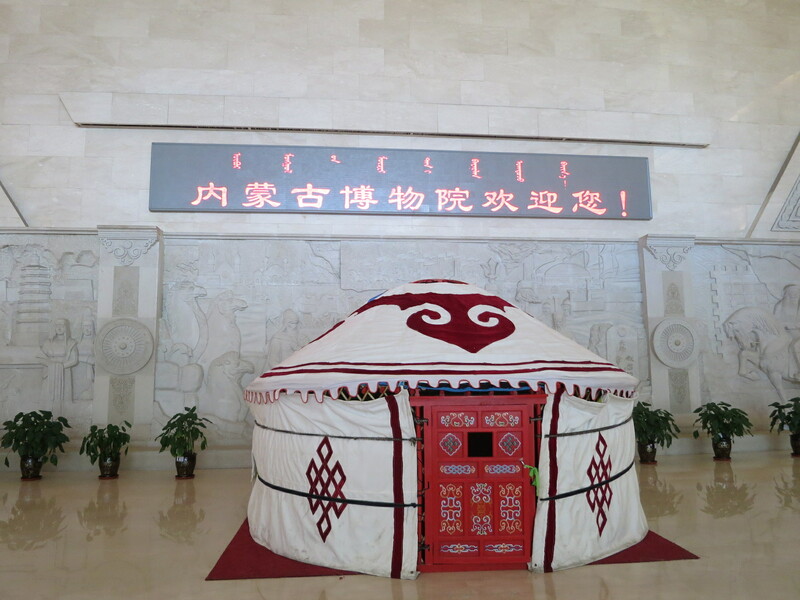 It was particularly fascinating to learn about the Mongols, Ewenki, Orochon and Daur ethnic groups. 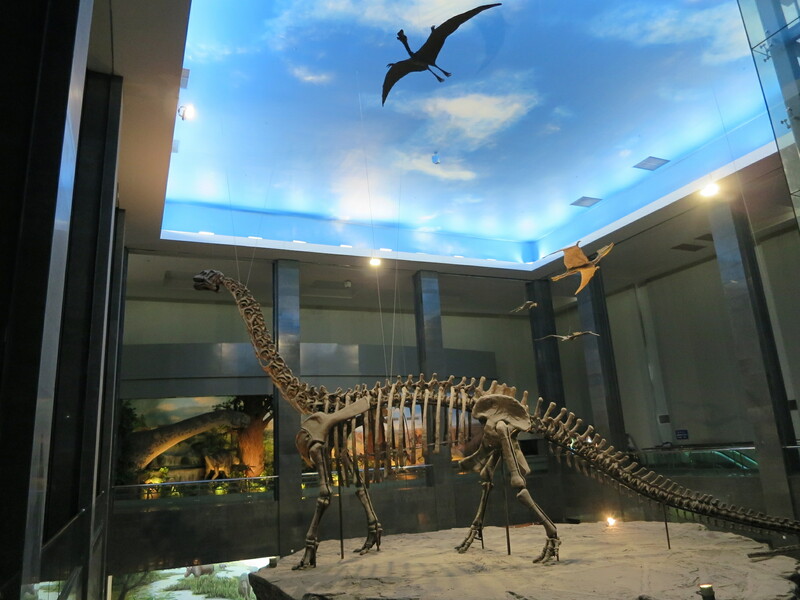 内モンゴル博物館。Inner Mongolia Museum. This place is gigantic! これは面白い光景だ。伝統的なパオの後ろには現代の高層住宅街が立つというコントラスト。This is a stark juxtaposition between traditional and modern buildings. 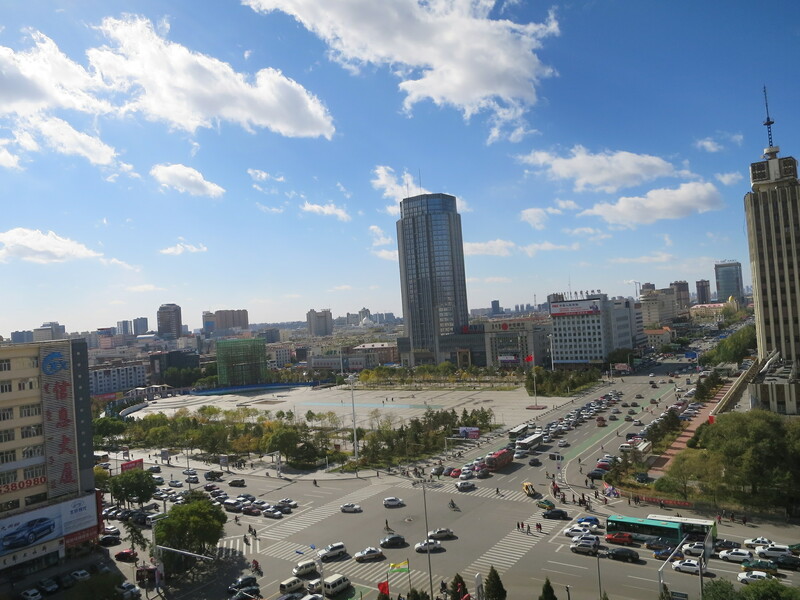 Hohhot is a gigantic city surrounded by beautiful nature. Even as it is slowly victimized by capitalism, there are still efforts to preserve and protect its indigenous cultures. 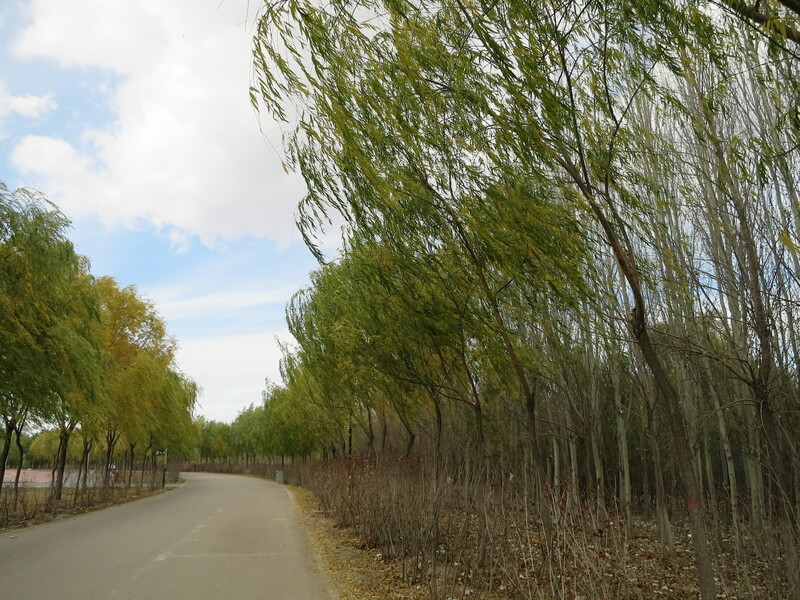 I would love to visit other parts of Inner Mongolia next time, during the right season of course! I took part in the Youth Conference for Education for Sustainable Development (ESD) over the past two days (10, 11 October). 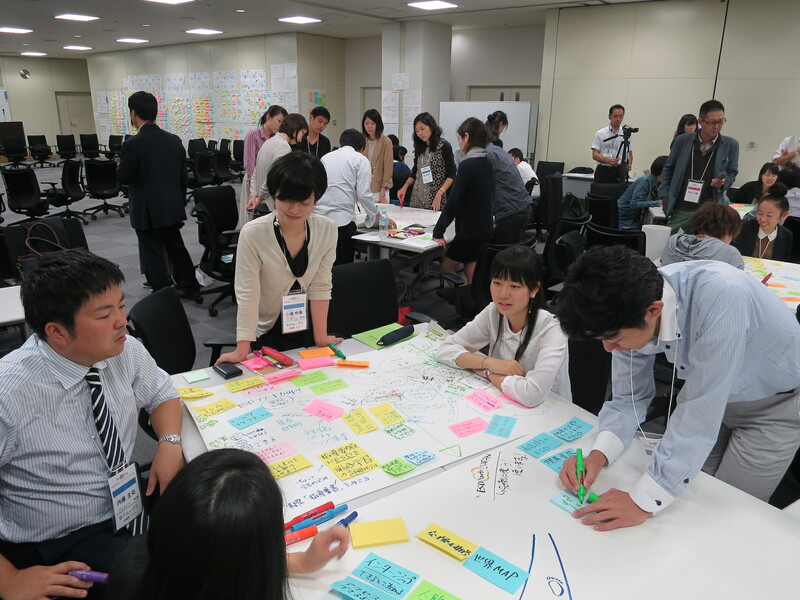 A total of 50 participants came from all over Japan, congregating in Fuchu City, West Tokyo, for a rigorous two-day workshop on the hot topic of ESD. This year marks the official adoption of Sustainable Development Goals (SDGs) that will take over the Millennium Development Goals (MDGs) with the summit held just a few weeks ago. 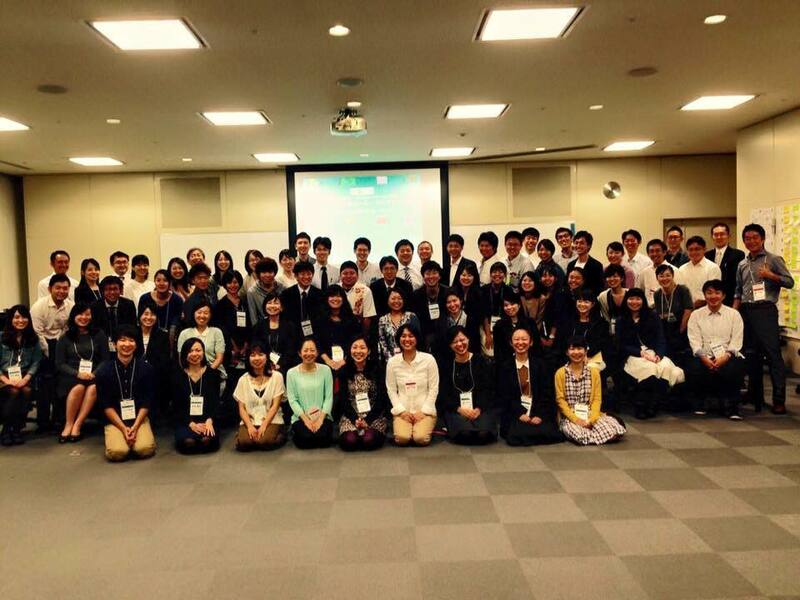 I had the greatest honour to be the only non-Japanese participant in this conference. ESD is rather ambiguous and vague as a concept. It basically means education that allows us to meet our needs today without compromising the limited amount of resources in the world for the future. Or to put it simply, it is education that thinks for the future. 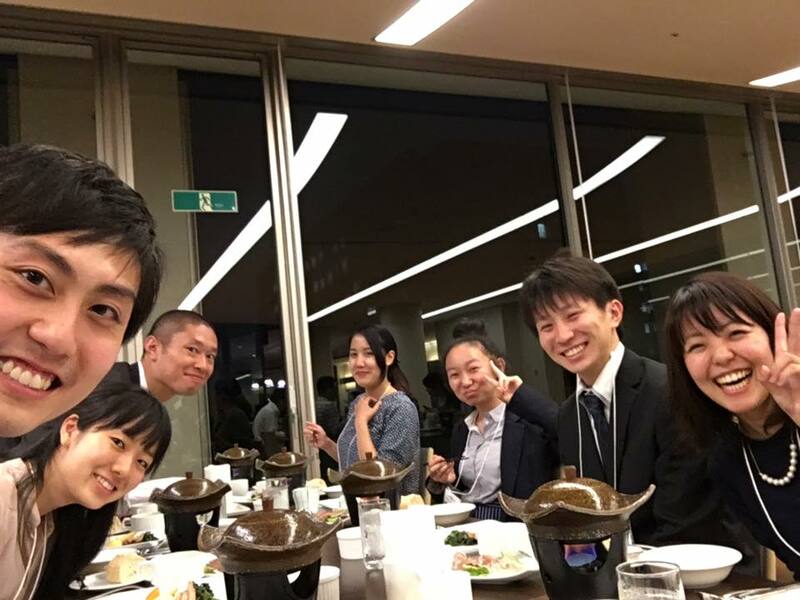 Among the members this time, we had primary, secondary and high school teachers, university students who actively participate in NGO activities, people working in education industries or UNESCO-related organizations and so on. All the participants are contributing to the implementation of ESD in one way or another. In fact, there isn’t a fixed method of implementing ESD, rather it evolves in a myriad of forms according to the fields. For example, learning about fair trade, multicultural understanding, energy problems, war and peace, refugee problems, hunger problems, poverty etc. are a way of practicing ESD. Understanding these problems not only allow us to save lives, but also preserve our resources for the future by preventing extreme climate changes and increase in the frequency and intensity of disasters. Other ESD methods include teaching how to look at a certain problem from multi-perspectives and improving media literacy (the ability to accurately interpret media and information). ESD doesn’t have to start from adults. In fact, it would be ideal to start ESD from young. Inculcating such skills and knowledge from a young age will give the child a broader mindset, key interpretative skills and soft skills such as peaceful dialogues and inter-cultural communication. ESD is a totally new form of education. In other words, we have to create a revolution in education, or a paradigm shift in the way we view our world through education. In our education system today, we are learning science, social studies, economics, geography, history and so on, separately. It is because of this, that we focus too much on economic development and technology advancement, leading us to neglect the environmental and biodiversity aspects of it, creating environmental and climate change problems. Sustainable development is to achieve development through the balancing of society, environment and economy. ESD is the education that acts a tool to achieve that. In fact, I believe that traditional Japanese ideologies and mindsets are extremely important in achieving sustainable development. The traditional Japanese mindset of respecting the environment, recycling and effectively utilizing natural resources, as well as the tendency not to waste, are essential in ESD. It has been an extremely enriching two-day workshop, having absolutely delectable meals, having the luxury of staying in a nice hotel room, and most importantly, having the opportunity to meet such active, positive and inspiring people!